With over 45 years of experience powering homes, you can count on us for all your electrical installation, repair and emergency service needs! Though often referred to as a “modern convenience,” electricity is a necessity for your home. Without a reliable electric supply, you cannot cool or warm a building, cook food or power medical equipment. Inability to do any one of these things puts your health, and even your life, at risk. Electric Blue, Inc. offers electrical installation, repairs and emergency services to homeowners across the Denver area. With our help, you and your family can live in safety, comfort and convenience. Though headquartered in Littleton, Electric Blue, Inc. serves homeowners throughout the Denver Metropolitan area. For nearly four decades, our team has consistently earned the praise of local homeowners thanks to our commitment to understanding the specific needs of Denver houses. We have detailed knowledge of the local climate, lighting conditions, weather patterns and other factors that affect the demand for, and risks to, electrical supply. We take all of these factors into account when installing, inspecting and repairing your equipment, ensuring that your electrical system will remain fully functional under even the most difficult conditions. Besides establishing an electrical system that is strong from the start, we are also happy to make emergency repairs if anything goes wrong. Our team will travel to your house, survey the damage and develop a solution that not only restores safety and power, but prevents similar problems from arising in the future. No matter how serious the emergency, Electric Blue will be by your side until it is resolved. 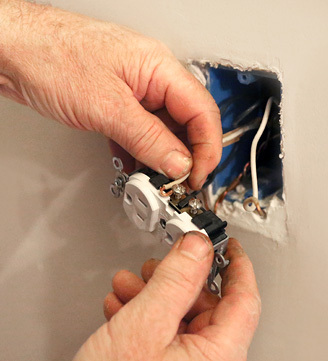 Professional wiring services by a highly-recommended electrician. Electric Blue, Inc. offers electrical services in Littleton for all your electrical needs. Residential services can range from home electrical services to apartments, condos and any other living spaces. Our services are not restricted to size and we’d be happy to help you. We are also 420-friendly, for those who ask. Don’t leave your house vulnerable to power loss, fire or shock. For more information or to schedule service, contact Electric Blue, Inc. today.